You’d have to be living under a rock if you haven’t heard of My Food Bag! 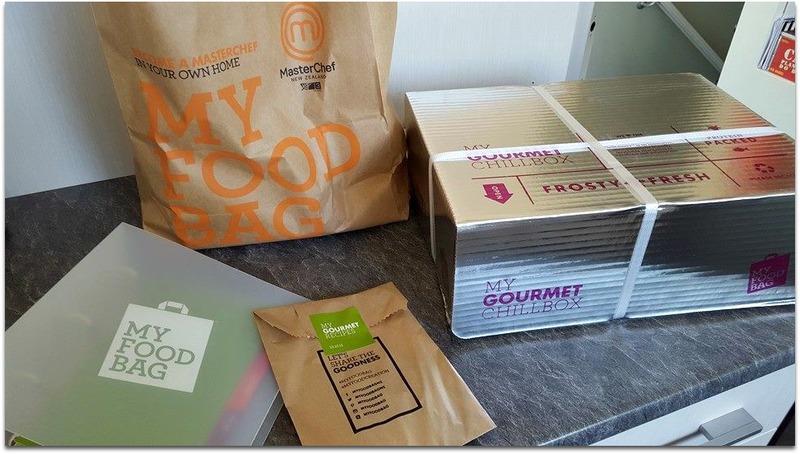 This is the brainchild of some savvy peeps who spotted a niche for delivering bags of delicious ingredients to your door, along with step by step nutritionally balanced and delicious recipes. You can read all about it here. I’d better save some space: This is going be a long blog post! 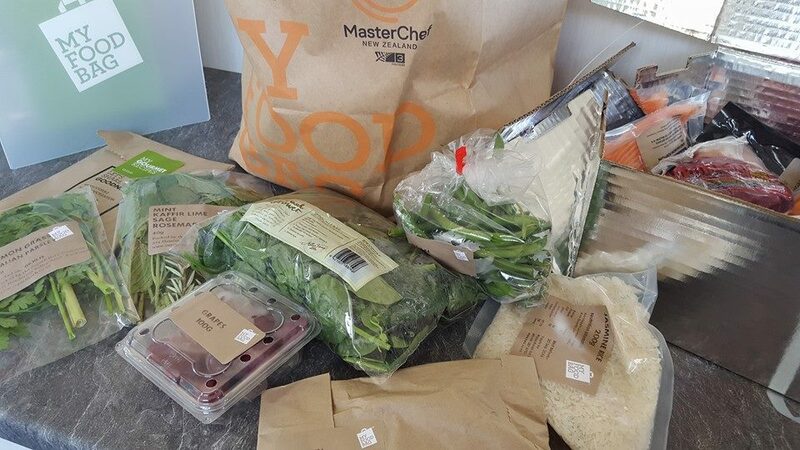 My motivation for trying out My Food Bag was simple: a) They’ve finally started delivering to Rotorua and b) I’ve totally lost my mojo for weeknight cooking. I just can’t get in the groove and we’ve fallen into the habit lately of having mince one night, chicken the next, salads for two nights, rice the next… You get the drift. There’s nothing wrong with this, but what’s been troubling me is that I just can’t get inspired about week night cooking (weekend cooking, no problem!). I own a crap-load of recipe books, hell, I am (ordinarily) a walking recipe book, but I just can’t think of what to cook. So I hoped My Food Bag would get me out of a spectacular cooking rut. What bag did we order? There’s five different bag options to suit fussy young kids, or hungry teenagers. I went for ‘My Gourmet Bag’ which feeds two adults four meals for a week. The price was $142 (inc delivery). 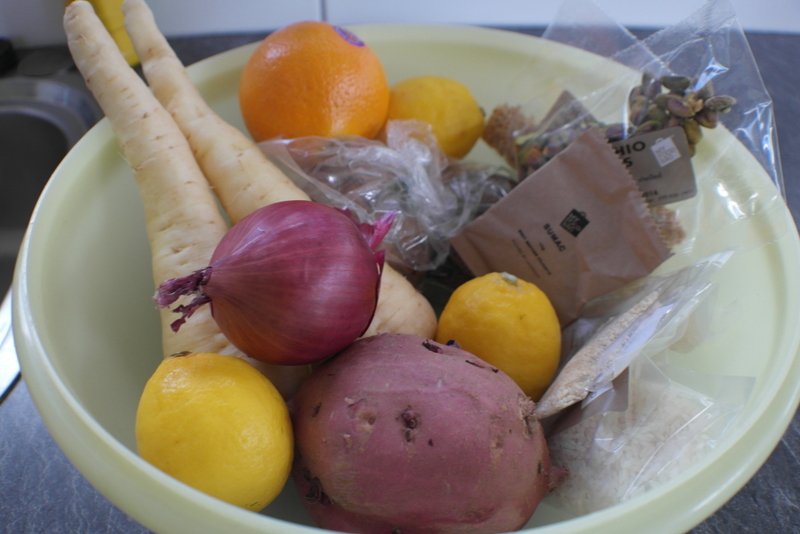 I decide against the My Family Food Bag option, which would also have fed our nine year old: He’s a fussy eater and I was just too nervous he’d turn his nose up. Besides, I liked the sound of eating gourmet with my hubby for four nights! Yet, to feed the boy, this meant I had to get organised and prepare some food in advance, I’m trying to cut down on cooking two separate meals! So I knocked up a Lazy Lasagna and this went down a treat most nights! How did we find My Food Bag? Here’s a narration of our experience! Our delivery was scheduled for Sunday afternoon between 3.00pm and 5.00pm. At 3.17pm a Courier Post van pulled up with a driver kitted out in a My Food Bag polo shirt. He cheerfully brought a box and bag of My Food Bag goodies to my door and greeted me with “Hello, you must be a new customer? Enjoy! See you next week!” The driver wasn’t even out of our driveway when my phone beeped with a text from My Food Bag saying “enjoy the goodness, if you have any questions, give us a ring”. It was like a Domino’s pizza delivery, only more thrilling. As someone who has trained in customer service and sales for a living, I was thinking that My Food Bag is nailing their customer service and PR so far. After pouring over the delivered ingredients and recipes I elected to keep the storage side of things simple: I placed all the grocery ingredients (coconut milk, pre-measured rice, spices etc) and vegetables/fruit not requiring refrigeration in a large salad bowl and popped these in the pantry. 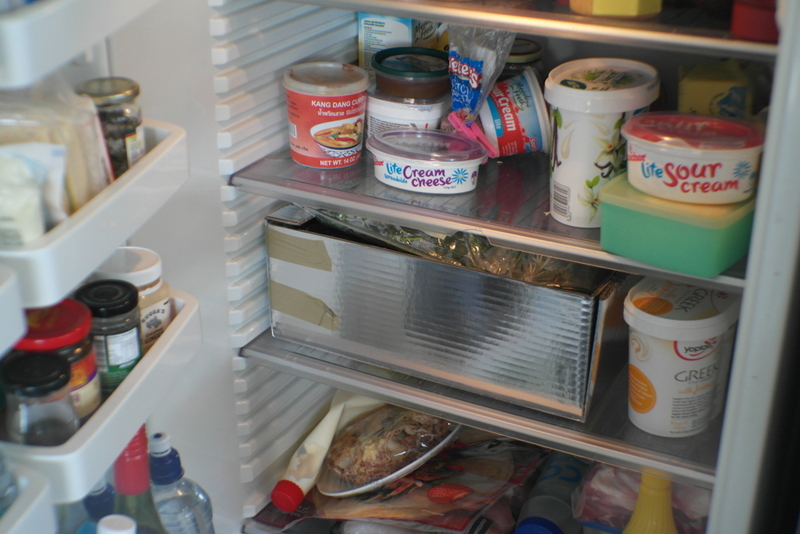 All the food requiring refrigeration went into the silver delivery /chiller box with the lid cut off, and placed on a cleared out shelf in the fridge. My logic is this: The easier it is to find the ingredients, the easier the food preparation will be. My husband is impatient and doesn’t enjoy cooking: If he has to hunt around in the fridge or pantry for ingredients, there’s a danger his wheels will fall off and he won’t cook. Therefore it’s imperative to create an easy cooking experience so he’ll do it again! (I know I’m out at least one night this week and the cooking will fall to him!). I hear that my friend has even used a bunch of these in ingredients in a microwave stew. This friend found his microwave through this list of the best microwaves and was so pleased with the results. Aside from an oversupply of dairy (yes, that’s three packets of haloumi in the door), note the silver MFB delivery box in the fridge! I’m clearly food motivated, I woke up full of beans, excited for dinner. Bring on Monday (this is quite a novel experience, springing out of bed with alacrity on a Monday morning). 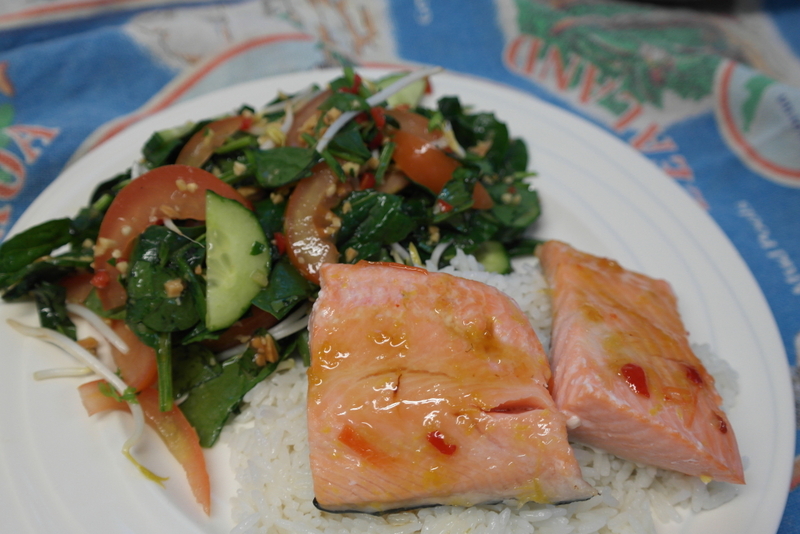 The Recipe: Sweet Chilli Salmon with Coconut Rice and Thai-style Salad. Chef capabilities required: Easy peasy! The instructions were relatively simple, though it would have been ideal if I’d read them first from start to finish (I’m a shocker for doing that). I accidently biffed an entire lemongrass stalk in to cook with the coconut rice… I should have saved half of it for the Thai salad dressing. Undeterred, I fished out half of the stalk and chopped it up to use in the dressing anyway. No problem. 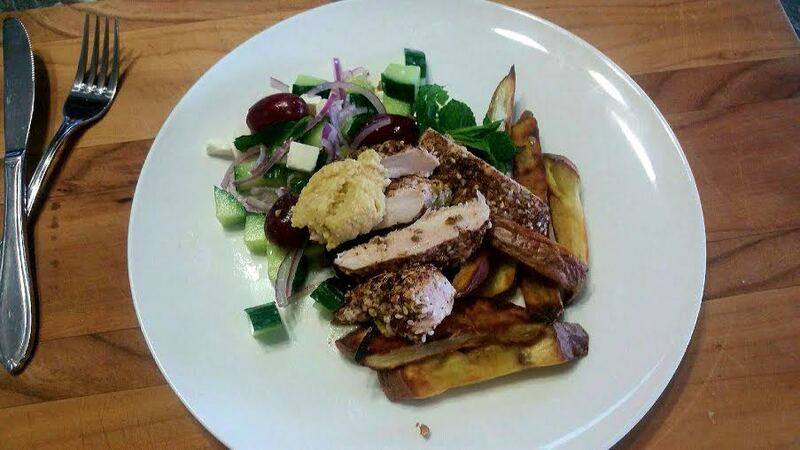 Feeds: The recipe said this’d feed 2-3. I’d definitely go with three, noting my hubby and I exercising portion control in the quest to get bikini ready for summer. Case in point, the photo shown is my dinner plate and I served up probably a quarter more than I usually would. To be honest, I could have eaten it all, but I’m a porker: If it’s in front of me, I’ll give it a good go. Anyway, I dug very deep, and I managed to stop myself half way through and I plopped the remainder in a Tupperware container for lunch, along with the rest of the salad I hadn’t dished up [polishes halo]. The Verdict: Bloody fabulous, restaurant quality Thai flavours. I’d make this again. I’d feed it to visitors. I’ll be making my coconut rice this way from now on. Cooking skills required: This was my husband’s one night to cook this week as I was having my greys touched up at the hairdresser! He said “it was pretty easy really”. Bear in mind cooking is not his gaff: It makes him grumpy. He’s also, ordinarily, allergic to following a recipe…. Hence I do the lion share of the cooking in our house. Feeds: 3 adults, smallish portions. Lucky me, I’m having this for lunch tomorrow. The Verdict: He said “delicious but too much red onion in the grape feta salad”. I reckon anything anyone else cooks for me is tip top. We’d have this again! One criticism, the lemon juice in the grape feta salad wasn’t enough flavour for me, so I drizzled a little bit of homemade raspberry wine vinaigrette all over – perfection. As for the sumac, this was my first time having it and I really enjoyed it! I love trying new foods and I’ll be getting this from Vetro on my next visit. My hubby is still raving that he loves how the grapes and feta were pre-measured. 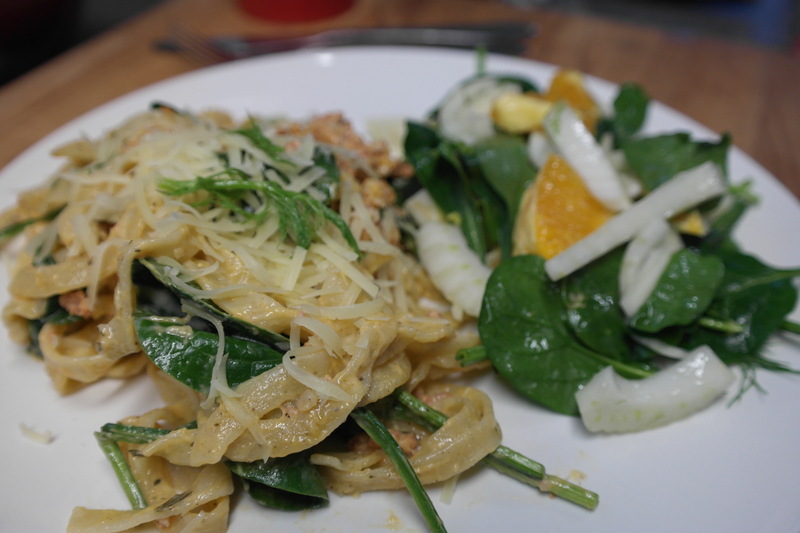 The Recipe: Chorizo and Rosemary Linguine with Fennel and Orange Salad. This is the recipe I was looking forward to the most! I’m a pasta fanatic. Cooking skills required: This was another straightforward and simple recipe, although I was in the kitchen for what felt like ages, as I had to cook something separate for the fussy nine year old (he didn’t Lasagna, he wanted Thai… Note, I followed the coconut rice recipe from Monday night and he loved it!). Must mention: The creamy pasta sauce method for this recipe is bloody genius, I’ll be making this again: Mix 5 Tlb sour cream mixed together with an egg and 50g grated parmesan. Fold this through the cooked pasta at the last minute, the pasta ‘cooks’ the egg and it yields a delicious, creamy sauce. Time to Table: 35 minutes (as per the recipe). Tick. The Verdict: Delicious. Loved it. Will definitely make this again. Only downer was I should have taken the seeds out of the half chilli though, it was a tad too spicy as the chorizo mince already had some heat in it too. Nit picking aside, it was scrummy. The fennel and orange salad was a brilliant and quick (3 minutes to make) accompaniment. Cooking skills required: No special cooking skills required. This is an impressive looking dinner that looks like you’ve been slaving in the kitchen all afternoon. That’s my kind of food. Time to Table: 25 minutes, as per the recipe! Feeds: Three. I had low hopes, but I decided to dish this up to my fussy nine year old. I told him the venison was steak. 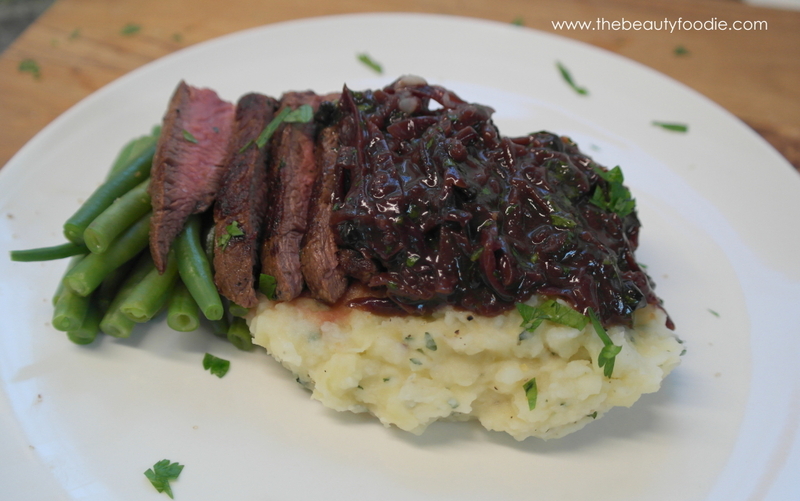 That the mashed potato had mint in it (it was sage) and that the red cabbage jus was crunchy gravy. He chopped it back and asked for more… And he ate two green beans (that’s a first. When he ate it I told him what it was, he was impressed he had been adventurous without trying! The Verdict: Amazeballs. This is hubby’s favourite meal of the weak. I’m deliriously happy my son ate it and enjoyed it! You know where this is headed, right? We are delighted! My Food Bag ROCKS. I’ve got my cooking mojo back. I’ve genuinely enjoyed being in the kitchen this week and, being a foodie, I’ve loved the taste and quality of the food. Hence, we’ve signed up for another week! Save time shopping: I spent ages hunter-gathering our food: Off to Countdown, pop into the Asian Grocery, get my nuts and spices at Vetro. Some weekends I can spend half a day getting what I need to set me up for a fortnight. Whilst I enjoy the shopping, I can also get a bit resentful. So MFB have saved me a tonne of time! Whoop. Quality: The quality of the ingredients is superb and fresh. The fruit/veg is seasonal, the meat is free-range. It gets you out of your comfort zone. This week we’ve used ingredients that we wouldn’t regularly use, or would save for a special occasion. The fennel and orange salad, for example, I’d never have made a salad with sliced fennel in it during the week. Now that I think about it, why not?! Similarly, sumac, venison, chorizo mince and sage are all ingredients I don’t use often, but will from now on. If you’ve hung in here till now, well done and thank you – this is a long blog post! Look, I just can’t fault My Food Bag. We want more, I can totally see why they’ve been so successful, they’ve got a winning combination. So, are you convinced? Going to give My Food Bag a go? Bargain Box Review – Does it live up to the hype?